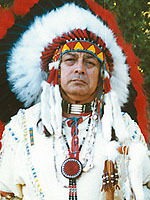 OldTownNewhall.com | Hart of the West Powwow 2000: Jess Walking Horse Remembers Fred Popejoy. 2000 Powwow at Hart Park on Sept. 23-24 is dedicated to a man whose voice mesmerized audiences, taught lessons of respect and survival. WHEN: Saturday, Sept. 23, 2000, 10 a.m. to 7 p.m.
"How Fred and I met, they had a miniature powwow at a county fair. He was displaying old-time artifacts with his daughter. "We didn't say much to each other. He looked at me kind of strange, and we started talking. I found out he was a storyteller. I'm a storyteller also." It was seven or eight years ago that Jess Walking Horse and Fred Popejoy discovered each other. They learned they had much in common: Both were retired from the food-service industry; they lived close to one another — Walking Horse in Apple Valley, Popejoy in Hesperia — and both had an affinity for sharing authentic Native American tales with children — and not the sort of tales that come out of books, either. "Fred got tired of people just reading out of a book and telling stories," Walking Horse remembered. Fred Popejoy (left) and Jess Walking Horse at an earlier Hart of the West Powwow in Newhall. Photo by Ken Lubas. Walking Horse, a Shoshone-Apache, and Popejoy, from a Delaware tribe, seemed the perfect match. Popejoy would tell stories of the animals while Walking Horse would provide accompaniment, imitating the sounds of coyotes, hawks and bears. "We live and see what the animals do," Walking Horse said. "That's how the Native American learned to survive. If you watch the animals, you will never starve." They took their act to school assemblies, powwows and carnivals throughout Southern California. As they gained recognition, they were invited to perform at museums, colleges and hospitals. Along the way, Walking Horse honed his storytelling skills, while Popejoy picked up on his friend's talent for animal sounds. Walking Horse recalled the audience response to their first act together some years ago. It was in a school auditorium in Apple Valley, filled with fourth-graders and up. "It was silent in the auditorium. I thought we bombed," he said. "All of a sudden, they just started clapping. "Fred had a voice that was mesmerizing. You couldn't help but listen to him," Walking Horse said. Popejoy laced his stories with lessons of respect, discipline and behavior — "everything a child should know about," Walking Horse said. "He would always add a message." "My grandfather used to tell stories with a little bit of comic (element) in them," Walking Horse said. "Fred and I did it in a way that was comical. It would stick in (the children's) minds." Roy Rogers and Dale Evans happened upon the duo one day at a mall and invited them to perform in Victorville each year. Before long, they were working as extras in motion pictures. 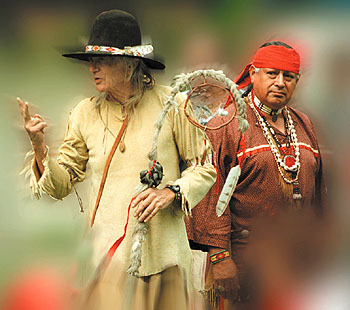 Wearing a war bonnet, Walking Horse dances around a campfire in the movie "Contact." "I was the only Indian they focused in on," Walking Horse said. "I'm dancing, and Jodie Foster glances my way." Winners of a coveted Golden Eagle Feather from the Title IX group, the pair never missed a "Hart of the West" powwow in Newhall — that is, until this year. Popejoy died Jan. 20. "It was a long while before I could tell stories again," Walking Horse confessed. But Walking Horse will return to the 2000 powwow to perform a ritual he has carried out every year: the blessing of the grounds. Walking Horse remembered how Popejoy roped him into the job. "Fred always used to put me into predicaments," he said. "There was supposed to be somebody to bless the grounds. Fred told them I was a spiritual person." 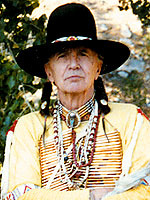 Walking Horse requested some divine assistance when he carried out the task at the first Hart of the West powwow in September 1994. "I called on the four winds to bless the grounds," he said. "The winds came from all directions." Next, he asked for the Creator. A flock of hawks appeared. "As I said to the Creator, 'thank-you,' all the hawks swooped down and flew away." That was a first and, for now, a last. Popejoy will be missed at Hart of the West, Walking Horse said. "He was always helping people at the powwow," Walking Horse said. "People would come up to him and ask him questions. "We were like two old owls," he said. Walking Horse is appreciative that the 2000 powwow is being dedicated to Popejoy's memory. "He was my best friend," Walking Horse said. "When he went, something went in me. "It was a great honor to be working with someone who loved children as I do, and who respected the old ways."